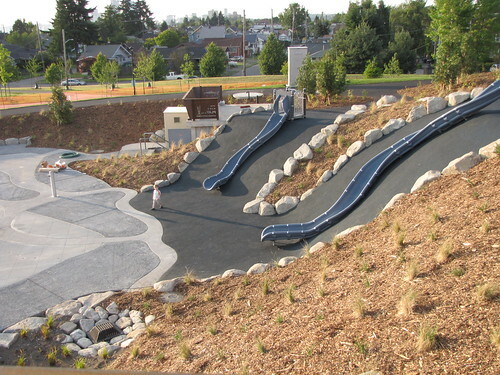 The slides at Beacon Mountain will be closed through December while the playground is revised and improved. Photo by Wendi Dunlap. You may have noticed the slides at Jefferson Park’s Beacon Mountain Playground have been closed. Have no fear — they are only closed so that Seattle Parks and Recreation can make the final revisions and tweaks to the new playground that opened in July. The work is being done in conjunction with the contractor and manufacturer of equipment, before the warranty expires. The work should be done by year’s end. The work will include additions and alterations to the playground including revisions to the surfacing in the spraypark and additions to the mechanical system for spray features; plant replacement and hillside fortification to prevent erosion; revisions to hillside slides; and additions to site furnishings such as picnic tables, benches, bike racks, and trash receptacles. New interpretive panels describing solar energy production in the park will also be installed. The slides will be closed through December. For more information (or if you want to suggest additional improvements), contact project manager Andy Sheffer, 206-684-7041 or andy.sheffer@seattle.gov. Previous PostFirst trees in the ground at the Beacon Food ForestNext PostHave you seen this chicken?